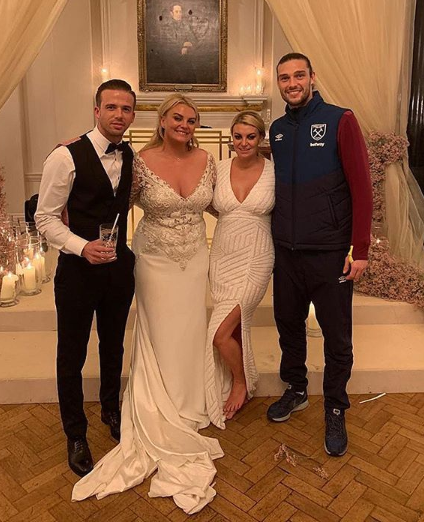 Hammer Andy Carroll was happy to be pictured in wedding photographs in his West Ham tracksuit. He was attending his fiance Billi Mucklow sister’s wedding last Thursday, the same day West Ham played Southampton away. The striker just made it to the wedding with just half an hour to go after beating Southampton 2-1 away. Andy booked a taxi for the two-hour ride after finishing the game at 9.30pm but he claims he didn’t get time to change out of his West Ham training kit and posed up for wedding pictures in his team tracksuit. One would hope he showered after the game. Andy Caroll and Billi Mucklow have yet to set their own date to be married despite being engaged since 2014. They have two children together called Arlo and Wolf.